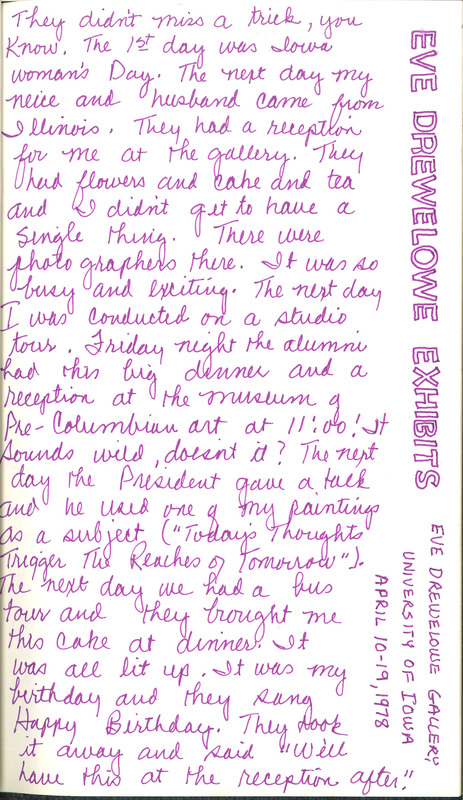 Eve Drewlowe Exhibits Eve Drewlowe Gallery University of Iowa April 10-19, 1978 They didn't miss a trick, you know. The 1st day was Iowa woman's Day. The next day my neice and husband came from Illinois. They had a reception for me at the gallery. They had flowers and cake and tea and I didn't get to have a single thing. There were photographers there. It was so busy and exciting. The next day I was conducted on a studio tour. Friday night the alumni had this big dinner and a reception at the museum of Pre-Columbian art at 11:00. It sounds wild, doesn't it? The next day the President gave a talk and he used one of my paintings as a subject ("Today's Thoughts Trigger The Reaches of Tomorrow"). The next day we had a bus tour and they brought me this cake at dinner. It was all lit up. It was my birthday and they sang Happy Birthday. They took it away and said "We'll have this at the reception after."